Quality processor. Definitely would build with it again. Very powerful cpu. Wish I'd waited for coffee lake, but this is still a good choice. It doesn't run too hot, and it has six cores and twelve threads which make it awesome for 3d rendering and recording/streaming. Great workhorse CPU for anyone planning on running many virtual machines, and processing graphics. It might not have the power to weight ratio for gaming like the K's, but it hits the sweet spot for work. Seems to run cool (in a custom loop) with some overclocking, I haven't given it a flogging yet so can't advise on the ridiculous yet. 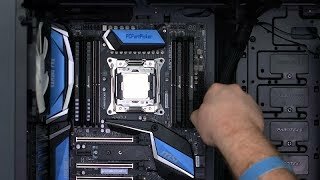 The 7800x is a great value in my opinion. I got it in a newegg bundle with the motherboard, cpu, and H75 cpu cooler so I ended up saving hundreds. As for performance, it does everything I need it to and more. My only gripe is the heat when overclocked but that's not too big of a deal with liquid cooling. Incredible processor! I have not had any problems with the processor overheating since I bought it, and doubt that I will have any problems with it for a long time. The processor was definitely worth the extra money for the X299 platform. Pretty awesome. Unfortunately, it runs pretty hot, but it overclocks like a boss! Honestly, I would not change it out for the 8700k though due to the lack of pcie lanes. Not that I am using very many. Suspect I might have over-specified this computer - since I've been unable to stress it at all. All the games I've got play at max resolution with no problems, and without causing the CPU any temperature problems at all - though some of that may be down to the awesome Kraken AIO cooler below! Beast of a processor, very stable and easy to overclock. Oc with Xtu running 4.7@1.25v stable with a max temp of 89c on the NH-D15 air cooler. Very satisfied with this Cpu.